Bolognese Sauce | Two Guys In a Cucina! So when we were making this sauce, Pedro had to fight against every instinct to just throw everything he had into it. Safe to say he doesn’t believe in recipes for sauces. I found this recipe from one of my many cookbooks and basically followed its lead but did not follow exactly… I guess my cousin is rubbing off on me. The sauce had a nice flavor to it… though Pedro complained that there was not nearly enough … man he whines a lot. Well enough of this… here’s the recipe.. Enjoy! Spices (oregano, chili powder, cayenne pepper, thyme, bay leaves, rosemary, paprika, crushed red pepper, salt, fresh ground pepper, cinnamon). Let the sauce sit on low heat between 2 to 4 hours stirring occasionally. Season, stir and savor the sauce!!! 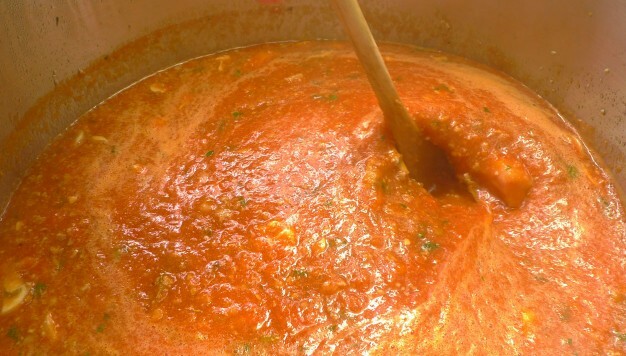 Note: Authentic traditional bolognese sauce recipes have only a small amount of tomato. The basic traditional ingredients are beef, pancetta, onions, carrots, celery, tomato paste, meat broth, dry white wine, and milk or cream. Some make use of pork or pork sausage with chicken, rabbit or goose liver.